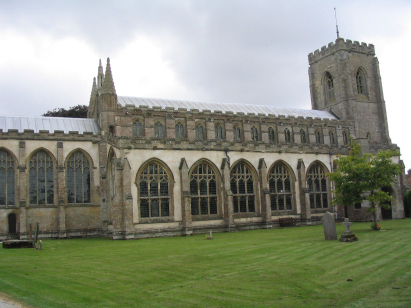 The parish of Walpole St peter lies in the far west of Norfolk within Norfolk's Fenland, indeed Walpole St Peter forms the western boundary of the county with Lincolnshire for a short stretch. The twin village of Walpoles St Andrew & St Peter lie in a triangle of land formed by the A17 (from King's Lynn to Sutton Bridge), the A47 (from King's Lynn to Wisbech) and the course of the River Nene (from Wisbech to Sutton Bridge). This is all man-made land reclaimed from the vast wetland that was once the Wash. The fertility of the land is second to none in Norfolk and led to a vast local wealth, nowadays it is still a vast, flat agricultural landscape predominantly growing various vegetables (the air has an odour of onion & leek at certain times of the year). The landscape is billiard-table flat (contours are nonexistent with the possible exception of the 0 contour) and filled with vast skies. Walpole St Peter is built a roughly oval-shaped group of lanes with the notional centre located to the western end of that oval. Parish sizes within the Fen district are much larger than those within eastern Norfolk, Walpole St Peter covered almost 7,000 acres making it probably 5 or 6 times the size of a Broadland parish, the rich soils also supported a large population and the parish probably held almost 1,500 parishioners. St Peter's church is one of the glories of Norfolk, if not the entire country, deservedly featuring in any guide to Britain's finest churches. It sits in its pomp at the northwestern corner of Walpole St Peter's oval of roads, its tower is visible for miles in the flat landscape. 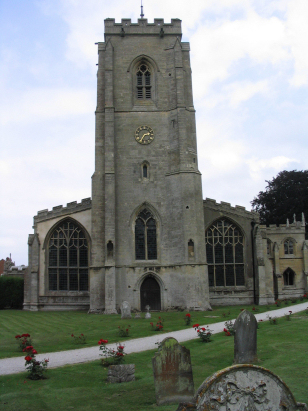 Pevsner waxes lyrical and at length regarding St Peter's church describing it as "one the most impressive churches of its date in the country". For once that date is clearly known as an earlier church was destroyed and washed away in a flood on 1337 and everything except the basal section of the western tower (which survived that flood) must date from after that date. The sheer scale of the building is impressive too, its length is 161 feet and a real challenge for photographers to encompass in a landscape shot! The building is a mixture of styles from the cusp between the Decorated & Perpendicular styles and was probably built between 1350 & 1450. The building sits within a churchyard bordered by a low brick wall and a very dainty lychgate grants access, as already stated there churchyard is insufficiently large to get far enough back to admire the full length of the building - this is definitely one to see and admire. Sadly the registers for Walpole St Peter were stolen from the church in the 1960s, for many years it was hoped they would surface through some obscure antiquarian collection but that has not been the case and it must now, after more than 50 years, be assumed they have been destroyed. To prepare this transcript the only available source was the extant Bishop's Transcripts which, judging by their numbering, indicate that there were 3 standard 1600-entry register books covering the period of this project and onwards into the 20th century. The Bishop's Transcripts are a notorious source being often damaged by the storage methods used for these loose bundles, those for Walpole St Peter are no exception. The quality ranges from the rather good to the extremely poor, the late 1830s and mid 1860s being particularly affected. Luckily the images of these records are now available to view and download from the free web site Familysearch which enables photoshoping techniques to be used to mitigate some of the difficulties. Despite these techniques there will almost certainly be some misreads within this transcript but hopefully they are few in number. In should be stated that, sadly and in common with most Norfolk Archdeaconry parishes, 1875 has been lost and consequently 56 entries are lost forever. The BTs reveal that the registers were at times irregularly kept, there being many entries out of date sequence and also a few with incomplete dates.